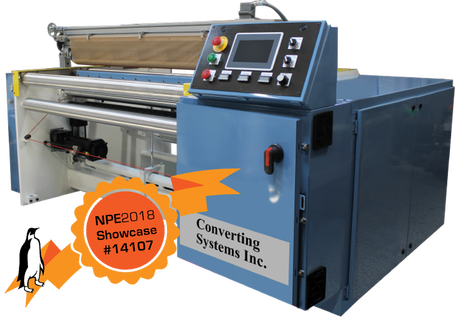 CSI Model 1830 - High Speed Servo Shuttle Style/Bottom Seal Plastic Bag Machine - Converting Systems Inc. Designed with operator and maintenance personnel in mind, this machine provides greater versatility on your production floor. Fully capable of running light gauge liner grade products at speeds of up to 350 FPM as well as heavy mil, gusseted products down to speeds of 30 FPM. Operators control all the machine functions and set-up through a color touchscreen, eliminating the need for operators or set-up personnel to go inside any enclosure. Features Indramat servo control platform, AC sensor-less vector drive and hollow core chrome rolls with replaceable journals. 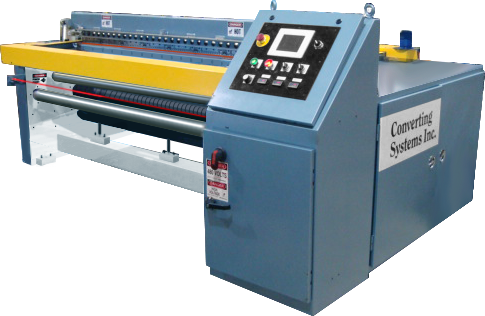 Runs in line OR out-of-line and works well with our Model 825 Coreless Winder.